“It’s official: The last — and most heated — outstanding gubernatorial race of the year has come to a close, with incumbent GOP Gov. Pat McCrory of North Carolina conceding in a Monday video message to Democratic challenger Roy Cooper. Despite continued questions that should be answered regarding the voting process, I personally believe that the majority of our citizens have spoken,” McCrory said. 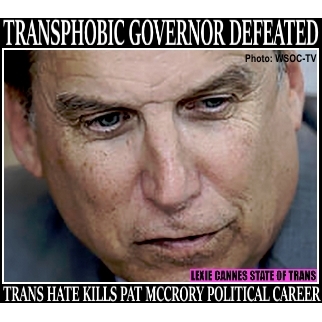 ORIGINAL ARTICLE: One of the most notorious anti-transgender politicians, Gov. Pat McCrory of North Carolina, has apparently been tossed from office by voters primarily for his unyielding support of anti-transgender legislation that was enacted earlier this year. “The ugliest political stunt this year does not even involve Donald Trump — he was trumped by Republicans in North Carolina’s state legislature and Republican Governor Pat McCrory. In a special one-day session yesterday, Republicans in both houses passed a bill banning cities and other local governments in the state from adopting trans equality ordinances — and was signed off by the governor on the same day. The fallout was massive. Businesses cancelled plans to locate in the state. Hundreds of millions of tourist dollars left the state. The NBA and NCAA pulled out championship games. Even Bruce Springsteen condemned the action and cancelled a concert. McCrory however, wouldn’t budge and is defending the legislation as it makes it way through the courts. The state’s attorney general, Democrat Roy Cooper has claimed victory in the North Carolina’s governors race even though he only has a few thousand point lead, but insist a recount will not change the outcome. McCrory has not conceded at this writing. A number of news media in NC has declared Cooper the winner. ‹ AMERICA, 2018 mid-terms! We get to work NOW! His opponent is pretty confident it will hold.